What is the cannon pinion? The cannon pinion connects the wheel train to the motion works. It’s also the post on which the minute hand is set on. If the cannon pinion is too tight, setting the hands will be very difficult. If the cannon pinion is too loose, the watch will lose time although the movement itself might be running very accurately. The cannon pinion starts to slip so the minute hand lags behind the movement. When you’re disassembling a movement, it’s a good idea to start with the motion works. At least as far as the cannon pinion. That’s because the cannon pinion is attached to the center wheel post by friction fit. If you don’t remove it, you won’t be able to lift the center wheel. The bottom plate of the Alpina 592 with a red arrow pointing at the cannon pinion. 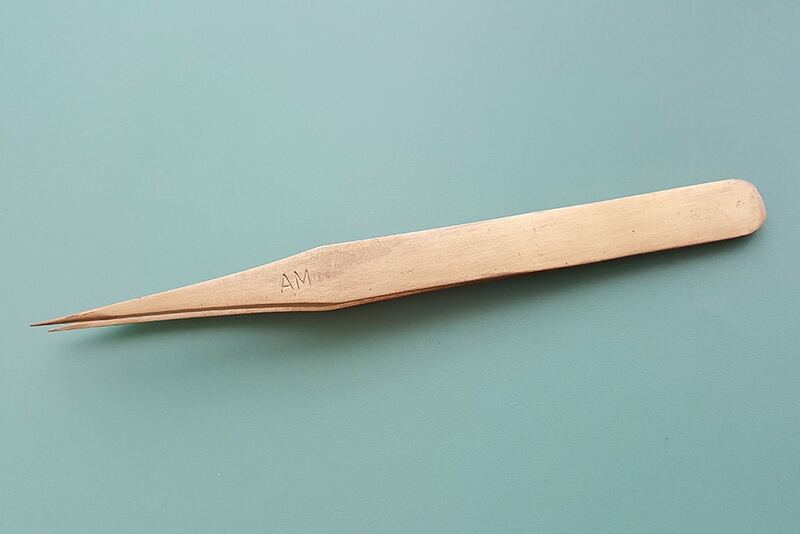 A brass tweezers in the AM version with a medium-fine tip. Tweezers are the easiest and quickest option. It works fine. I’ve removed many cannon pinions with tweezers. Make sure you use a brass pair, so you don’t damage the cannon pinion or the main plate. However, it’s not the safest option. Especially if the cannon pinion is stuck or the movement has a sweep second (or both). The sweep second pinion sticks out so you can easily bend or snap it if the cannon pinion suddenly comes loose. That’s exactly the reason why I don’t use this method anymore. You can safely use it for cannon pinions that don’t give the friction such as the ETA 2390 and the AS 1950/1951. These tools are specially designed to remove cannon pinions, so they work like a charm. Place the head over the cannon pinion and let it rest on the movement plate. Hold the wooden handle with one hand and push the handle down with the other hand. The collet will close and it’ll pull the cannon pinion upwards while the white plastic part stays in contact with the movement. It works wonderfully, but the downside is that it’s only suitable for cannon pinions with a diameter of more than 1 mm and many cannon pinions are smaller. Sometimes, you can find older specimens on the internet that have an additional collet so they’re also suitable for smaller cannon pinions. 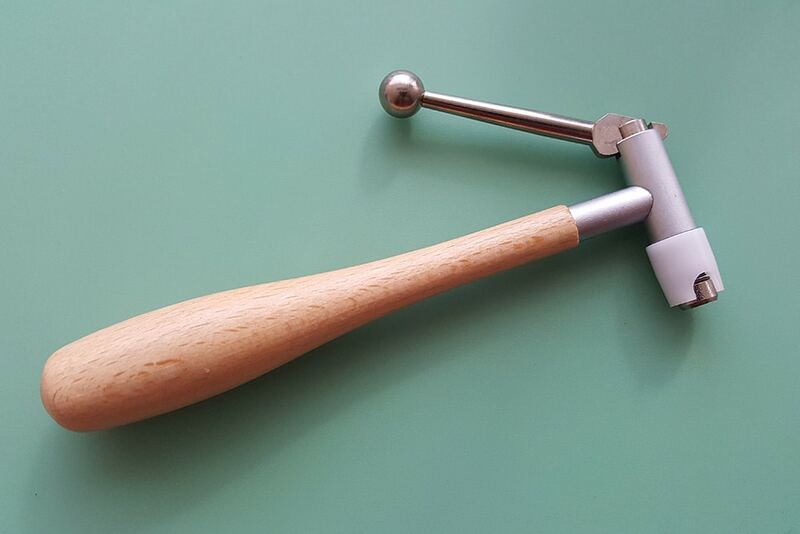 Bergeon PRESTO cannon pinion remover with the green handle. PRESTO tools come in different versions. The one with the green handle is for removing cannon pinions and pocket watch hands. It’s similar to the one with the black handle, but it’s sturdier and stronger. You hold the handle in one hand and maneuver the beak underneath the notch of the cannon pinion with the other hand. Then you squeeze the two metal bows on the side to lift the cannon pinion. You don’t have to lift it all the way. Just enough so that you can safely remove it with brass tweezers. As you can see there are different ways to remove the cannon pinion but I prefer the PRESTO tool. It works for all watches and you won’t damage the main plate or other parts. What is your preferred method of removing the cannon pinion? Let me know in the comments below. Great article and education for the novice watch geek and collector. Thanks, Larry. I’m glad you like it.